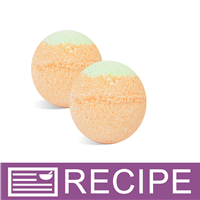 These cute pumpkin-inspired bath fizzes are scented with a lovely pumpkin coconut cream fragrance. 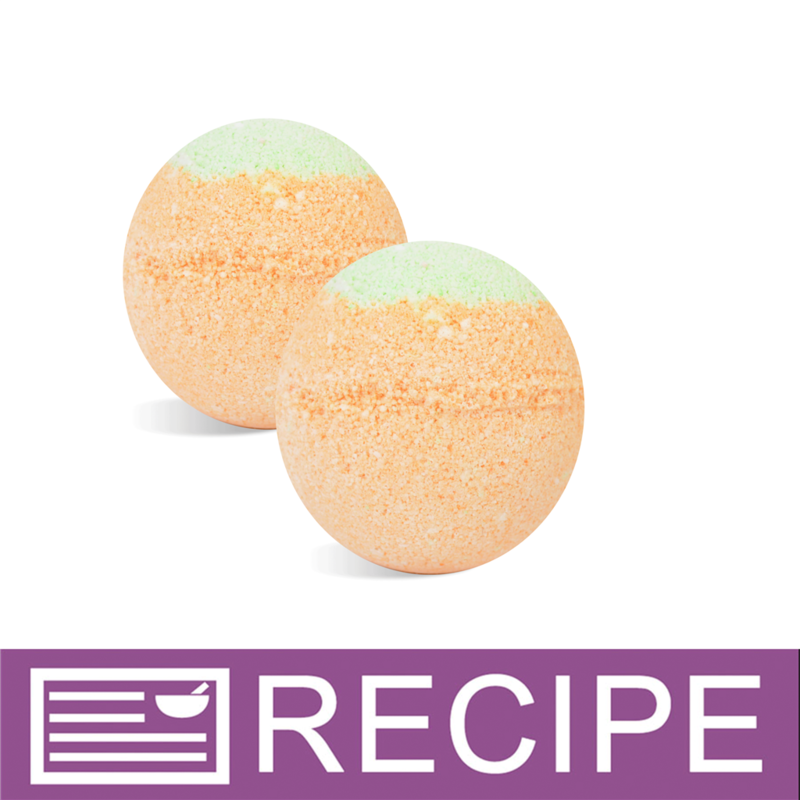 This recipe utilizes Shea 50, which doubles as a moisturizer and solubilizer. Drop one into a bathtub and soak in the effervescence. NOTE: If you are making these products for sale, good manufacturing practices recommend you wear a hairnet, gloves, and a mask. We also recommend a clean apron and workspace. To mixing bowl, add baking soda, citric acid and arrowroot powder. Mix well. Move 2 oz. of powder mixture to second bowl. Add blue and yellow color and mix well. Add orange color to large bowl of powder mixture and mix well. Scoop a small amount of green mixture to one mold half and top off with orange mixture. Place orange mixture into second mold half. Press two halves together. Remove top and brush off any excess. Replace top and set aside to harden. Repeat until all fizzies are molded. Let harden overnight and remove from molds. Ingredient Label: Baking Soda, Citric Acid, Arrowroot Powder, Shea Butter, Fragrance, Yellow 6 Lake, Fluorphlogopite, Titanium Dioxide, Tin Dioxide, Ultramarine Blue, Iron Oxide. "Can more fragrance be added? What amount should I add for a medium scent? I bought this kit, and the directions state 2ml FO. If my calculations are correct, that's 0.5% of the recipe dry ingredients. The Pumpkin Cream FO guidelines state 5% to 10% for bath fizzes. I'm concerned that half an ounce is going to make for weak smelling baths. For my personal use only, not resell. Thanks! " Staff Answer We choose to make our bath fizzies lightly scented. If you prefer a heavier scent, you can certainly double the amount in the recipe. If a fragrance has a higher IFRA, you do not always want to add that much to your product. Adding 5% fragrance would be too much liquid added to the bath fizzy mixture. "Will these turn brown from the vanilla content in the fragrance? " Staff Answer You may see a slight discoloration from the fragrance. You can add the Vanilla Color Stabilizer for CP to the fragrance oil to prevent this from occurring. "Can I substitute raw Shea butter for the Shea 50?" Staff Answer We recommend using the Shea 50 as it is a water soluble product. It will not add any greasy and slippery feel to the bath like shea butter would. 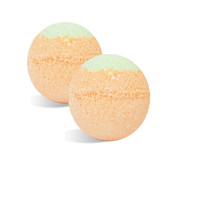 Also, you can use this in your bath fizzies and not have to add Polysorbate 80.